Goats milk is packed with natural AHA's (alpha hydroxy acid) which is brilliant for softening the skin, generating new cell growth and eliminating fine lines. Goats milk alone is loaded with vitamins and minerals. Goats milk is often called the skins super food! To this amazing ingredient we've added British Quince and organic Manuka Honey from New Zealand. 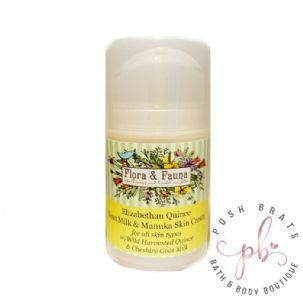 Ladies of the Elizabethan court used salves and skin toners containing quince. Quince helped their skin stay soft and supple and eliminated skin irritation. Goats milk is packed with natural AHA's (alpha hydroxy acid) which is brilliant for softening the skin, generating new cell growth and eliminating fine lines. Goats milk alone is loaded with vitamins and minerals. Goats milk is often called the skins super food! To this amazing ingredient we've added British Quince and organic Manuka Honey from New Zealand. Ladies of the Elizabethan court used salves and skin toners containing quince. Quince helped their skin stay soft and supple and eliminated skin irritation. Rosehip seed oil contains Vitamin A. Vitamin A helps to delay the effects of skin aging, assists with cell regeneration, and promotes collagen and elastin levels to increase. This results in firmer, smoother, and more youthful skin with greater elasticity. Black Currant Seed Oil is useful in preventing premature aging as it reduces wrinkle formation and repairs tissue damage. It alleviates eczema, reduces inflammation, soothes itching, moisturizes and restores fatty acid balance. Aloe Vera: Aloe leaves contain a plethora of antioxidants including, beta carotene, vitamin C and E that can help improve the skin's natural firmness and keep the skin hydrated. Hydrolyzed Silk Protein: Silk Protein, Hydrolyzed is useful in elegant hair and skin preparations for its excellent moisture binding properties, repair, and feel. In addition, this non-animal protein source is substantive to skin and hair and provides a protective barrier. Aids in moisture retention due to its strong hygroscopic properties (silk is credited with the ability to retain 10,000 times its weight in water), resulting in optimum conditioning and increased strength. © Copyright 2016 Posh Brats Ltd All rights reserved.